Gillnetting is a type of boat that focuses entirely on catching salmon (sockeye) through the use of drift gillnetting and set gillnetting. Set gillnetting is far less common for commercial fishing and thus, drift gillnetting is the main focus for fishermen. Using nets that in many ways resemble a large badminton net, and placing it across the path of migrating salmon, the fish become entangled from their gills. The drift gillnetting nets are lowered and allowed to flow freely while fish become entangled. A “set” can last a few minutes or the better part of the day depending on the season, weather and number of fish being caught. When the net begins to jiggle it is pulled up and the fish shaken from the netting. The net is then put back into the water and the fish processed. Gillnetting boats are primarily found in the Southeast, Prince William Sound, Kenai Peninsula and Bristol Bay. 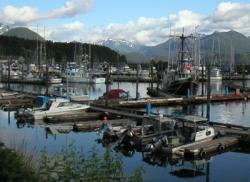 On our Alaska commercial fisheries calendar these areas are listed as Areas 1, 2 and 5. The season runs from June into mid-September. Job seekers are encouraged to arrive in late June. It might sound like ‘trial and error’ but those looking for work often find the best jobs walking the dock looking for work directly. Placing resumes and note cards onto bulletin boards in certain harbors is another common way work is found on a Gillnetting boat. These tactics are described in further detail in our Job Search Strategy section. Inexperienced gillnetters usually earn about 5% of the total catch while experienced workers can make nearly 12%. This comes out to earnings close of $4,000-$7,000 for a six-week run. The hours certainly vary with many workers putting in full days, seven days a week. Other times, the hours are less. All of this varies depending on the time of year, number of fish and other fluctuations in the industry. Gillnetting used to be a very controversial method of catching fish. The nets dragged along large portions of the ocean would often entangle anything in its path, endangering all types of sea life. The nets today, are more discriminate toward salmon but still manage to capture other marine life from time to time. The most lucrative place for gillnetting is in Bristol Bay with salaries ranging from $6,000 – $10,000 for a six-week period. However, travel to the region is much more expensive and a better region for those with experience to find work. Although, if you can get to Bristol Bay cheaply and don’t mind a tough job search, it may pay off well in your favor. While you might get more days off and earn large crew shares, the ability for greenhorns to earn jobs on a gillnetting boat is much more difficult. A typical job includes cooking, cleaning and running nets – sometimes, for hours and days at a time, before receiving time off. Boat sizes are modest and crews usually entail a skipper and one or two deckhands. The lack of large crew numbers means jobs can be difficult to procure in this fishery.